AIIMS New Delhi Notification is out. AIIMS New Delhi is recruiting for 1372 Nursing Officer Govt Job Posts. You can check AIIMS New Delhi - All India Institute of Medical Science last date, download AIIMS New Delhi notification, visit AIIMS New Delhi official website and check other AIIMS New Delhi Vacancy details.Complete Vacancy and recruitment Details about 1372 Nursing Officer Govt Job vacancies in AIIMS New Delhi are provided below by JobSarkari.Com only for you. Last Date of Apply Online. 07/02/2019. Date of Admit Card. 19/02/2019. Mode of Payment. Candidate Need to Pay Application Fee Through Gateway Online Mode. VMMC & Safdarjung Hospital 668 353 161 90 1272. Kalawati Saran Children Hospital 29 13 09 07 58. Lady Hardinge Medical College & Associated Hospital 32 04 05 01 42. Total No. of Post 729. 370. 175. 98. 1372.
from an Indian Nursing Council. Candidate Must Have Passed B.Sc (Post-certificate)/Post Basic B. Sc. Nursing from an Indian Nursing Council And Registered as Nurse & Midwife in State/Indian Nursing Council. Candidate Must Have Passed Diploma in General Nursing Midwifery from an Indian Nursing Council And Registered as Nurses & Midwife in State/Indian Nursing Council Recognized Institute/Board or Council and Having 02 Years Experience in Minimum 50 Bedded Hospital After Acquiring the Educational Qualification. 4. Candidate Need to Login With ID and Password to Complete the Application Process. 6. Candidate Need to Apply Online On or Before 07th February, 2019. Q. 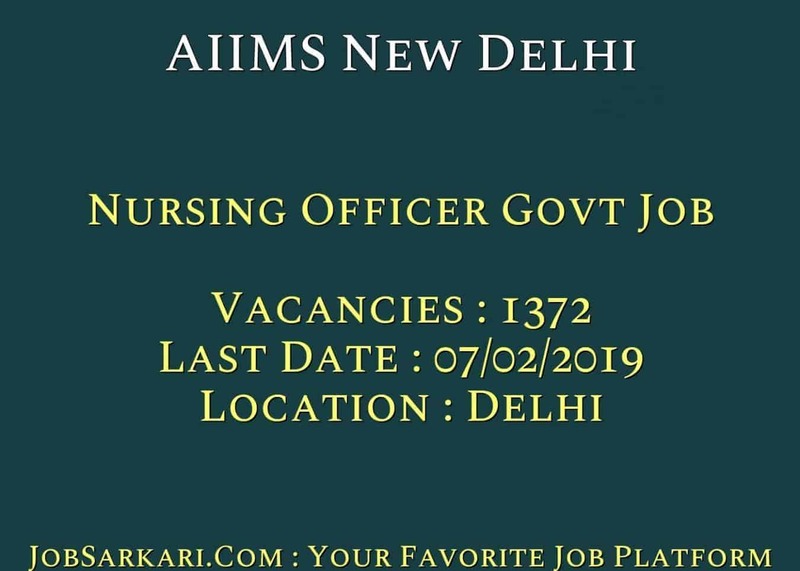 What is the Last Date For AIIMS New Delhi Nursing Officer Govt Job Vacancy ? A. 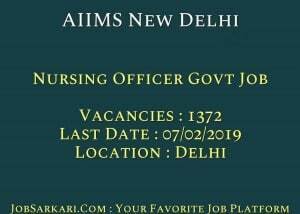 Last Date for AIIMS New Delhi Nursing Officer Govt Job Posts is 07/02/2019. Q. What is the Form Type of AIIMS New Delhi Nursing Officer Govt Job Recruitment ? A. The Form Type for AIIMS New Delhi Nursing Officer Govt Job Posts is Online. Q. How many vacancies are available in All India Institute of Medical Science Nursing Officer Govt Job Posts ? A. There are about 1372 Vacancies in All India Institute of Medical Science Nursing Officer Govt Job Posts. Q. What is the Full Form of AIIMS New Delhi ? A. Full Form of AIIMS New Delhi is All India Institute of Medical Science .